Our mission is to be the premier network for Asian women around the world by providing first-class training and learning opportunities while promoting an active and supportive network of high achieving women with the aim to accelerate the advancement of Asian women in business and in the workplace. Chi has 20 years of experience in Human Resources in New York and Asia. Her career began at a Japanese trading company after which she joined a leading U.S. investment bank. There, she was involved in the talent development and management of over 4,000 employees, serving as a trusted advisor to senior business leaders and led human resources teams supporting revenue divisions across the Asia Pacific region. In 2014, Chi embarked on a new venture to empower professionals through one-on-one coaching and group training seminars to assist them in advancing their careers. She specializes in high-potential female professionals, working closely with them to successfully become impactful and empathetic leaders that are able to navigate the modern workplace. Her consulting engagements are broadly focused on key themes including diversity strategy, organizational development, leadership and talent management, and career transition strategies. Chi received her certification in Organizational Development through New York University. Mish worked at Goldman Sachs in New York and subsequently in Tokyo as the Asia head of her department, where she was involved in the people development of over 100 employees and to date has recruited, trained and coached over 1,000 professionals. In 2012, she followed her passion and launched her coaching practice and developed targeted programs focused on effective leadership and communication skills. Mish consults with global organizations on diversity strategy, talent development and global communications training. She is a board member for Platform, an organization aimed at training and developing women leaders in API communities serving the marginalized. Founder and CEO of anzucco. Kyoko's career began as an equity research analyst at Morgan Stanley, followed by Goldman Sachs. Upon witnessing the challenges of female colleagues in the office who find it difficult to continue working after having children, she discovered that Japan lagged in prenatal and postpartum services for women. In 2014, she left the financial industry and founded anzucco, a company specializing in prenatal and postpartum services. The company provides new services that mothers seek and need, but also innovative career opportunities for midwives. Inspired by THE CHOICE’s mission to support working women, she has joined as the Director of its Tokyo Chapter. From 2018, she started a role as a business consultant at an international company utilizing her financial background and experience as an entrepreneur. She balances her multiple careers as a working mother. Suzanne Price is the founder of Price Global, a change agent specialising in Diversity and Inclusion, Developing People and Wellness. Suzanne is based in Tokyo providing services throughout Asia Pacific. In 2012, she received the British Business Award for Entrepreneur of the Year from the British Chamber of Commerce in Japan. Suzanne is also recognized as one of the Top 10 Consultants in The Economist Global Diversity List. Believing in THE CHOICE’s potential to have a positive impact on Japan’s diversity landscape, Suzanne has joined as a senior advisor of its Tokyo Chapter. Dr. Junko Cancemi ‘s engagement in the field of Early Childhood Education in an international school context spans over 30 years in Japan, with work experiences in both teaching and leadership roles. She is co-founder and Executive Vice President of Cancemi Corporation and also serves as the Head of JC Academy, Cancemi Corporation’s strategic unit specializing in providing innovative and creative solutions for human development through workshops, lectures, presentations and consultations locally and abroad. 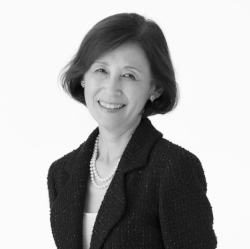 Moved by THE CHOICE’s vision to empower women, Junko has joined as a senior advisor of its Tokyo Chapter.